Algernon Vereker’s best friend Manuel Ricardo is looking forward to a cruise on the luxury liner Mars, and persuades an overwrought Vereker to join him. Once on board, Ricky’s mind is on romance while the amiable and eccentric Vereker is keener to relax with a cigar and a good book – until murder at sea means an abrupt detour into spine-chilling mystery. Vereker starts to investigate Mrs Mesado’s demise, which presents many baffling features – beneath borrowed gloves, the lady’s hands were cut and bruised; and where was the diamond necklace she had been wearing earlier that evening? These and other conundrums must be solved before Vereker can bring the culprit (or culprits) to justice, but as Ricky sagely observes: “half the fun of eating a nut is cracking the shell”. 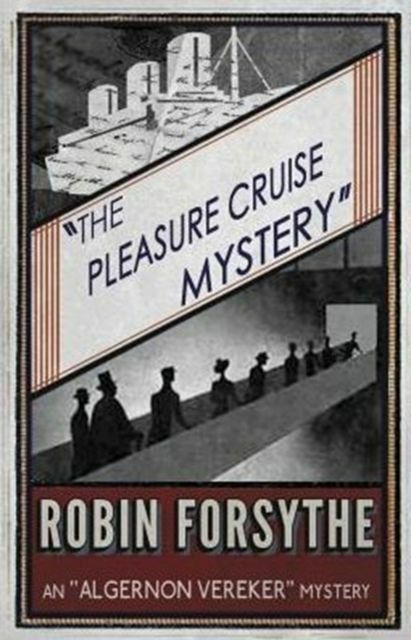 The Pleasure Cruise Mystery (1933), a light-hearted but lethal maritime whodunit, is the third Algernon Vereker detective novel. It is republished here for the first time in over 70 years, and includes a new introduction by crime fiction historian Curtis Evans.